Residents of the RiverHouse Apartments (1400 S. Joyce Street) were recently informed by their landlords that their monthly parking rates were about to jump substantially if they park their cars in the nearby Pentagon Row garage and surface lot. Starting Jan. 1, anyone from the apartment complex parking there will pay $100 month per space, up from $65. 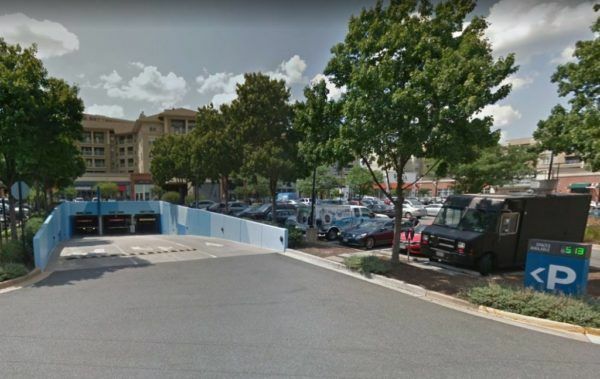 The parking managed by Colonial Parking, not JBG Smith (RiverHouse’s owner, the area’s dominant real estate developer and a key player in bringing Amazon to the area). Accordingly, RiverHouse management lamented in a letter to residents, provided to ARLnow, that it isn’t able to control such a change. “Please rest assured that this increase was just as much a surprise to us as this is to you,” General Manager Joe Mettee wrote. Colonial Parking did not respond to a request for comment on what prompted the sudden increase. But Megan Niewold, a RiverHouse resident set to see her parking rates skyrocket, told ARLnow that she has her suspicions about their motivations. Concerns over how the tech giant’s new headquarters, and its promised 25,000 workers, will transform the area are certainly nothing new. The company’s selection of Arlington for half a new headquarters has already spurred development activity in both Pentagon City and Crystal City, and other such changes are surely on the way in the coming months. Though county officials are hoping a slew of new transportation options will encourage Amazon employees to opt for public transit instead, neighbors fear that the area is already facing a parking crunch, which will only be exacerbated by similar price increases. The good news for people like Niewold, at least, is there are some other options. RiverHouse added in its letter that it’s knocking down some of its own parking prices for anyone frustrated with the Pentagon Row increases.